CORRECTION, June 25, 9:32 a.m.: In an earlier version of this story, information that the Red Hen restaurant in Washington, D.C., had no relation to the Lexington establishment was incorrectly deleted. The two restaurants are not affiliated. White House press secretary Sarah Huckabee Sanders said Saturday she was booted from a Virginia restaurant because she works for President Donald Trump, becoming the latest administration official to experience a brusque reception in a public setting. She said the event Friday evening said far more about the owner of the restaurant than it did about her. "I always do my best to treat people, including those I disagree with, respectfully and will continue to do so,'' Sanders said in the tweet from her official account, which generated 22,000 replies in about an hour. The restaurant's co-owner Stephanie Wilkinson told The Washington Post that her staff had called her to report Sanders was at the restaurant. She said several restaurant employees were gay and knew Sanders had defended Trump's desire to bar transgender people from the military. Employees at the restaurant told The Associated Press that Wilkinson wasn't available for further comment. 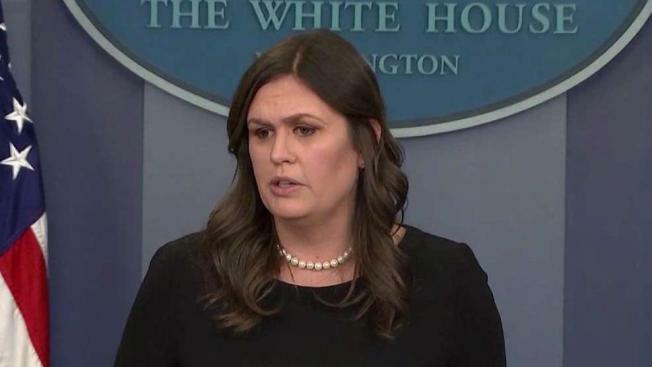 Sanders' treatment at the restaurant created a social media commotion with people on both sides weighing in with their critique, including her father, former Arkansas governor and Republican presidential candidate Mike Huckabee. But many were also supportive of the restaurant owner's actions. "12/10 would recommend. Bonus: this place is run by management who stuck up for their beliefs and who are true Americans. THANK YOU!!!!'' said a comment from Commerce City, Colorado. The Red Hen restaurant in Washington, D.C., which has no relation to the Lexington establishment, received misdirected attention after Sarah Sanders' tweet. The restaurant posted a statement to Twitter and Facebook for clarification. Good morning! @PressSec went to the unaffiliated @RedHenLex last night, not to our DC-based restaurant. There's a restaurant by the same name in Swedesboro, N.J. that also had to put out a statement on social media, NBC10 reports. Lexington, located in the Shenandoah Valley and a three-hour drive southwest of the nation's capital, is politically a spot of blue in a sea of red. It sided with Democratic nominee Hillary Clinton in the 2016 presidential election, by a 2-1 margin. It's the county seat of Rockbridge County, which went with Trump by a similar margin. And it is home to Virginia Military Institute and Washington and Lee University. "We support our own here, great little community we have,'' he said. Earlier in the week, Trump's homeland security secretary, Kirstjen Nielsen, cut short a working dinner at a Mexican restaurant in Washington after protesters shouted, "Shame!'' until she left. Brian Tayback, of Shrewsbury, Pa. and Brandon Hintze, of Alexandria, Va., walked by the restaurant during a visit to Lexington on Saturday. Tayback said he believes the owner made the right decision. "They're taking a stand against hate,'' Tayback said.